Bibs are the first line of defense against stains. But they can be tough to clean. Let’s face it, stains are inevitable part of child rearing. 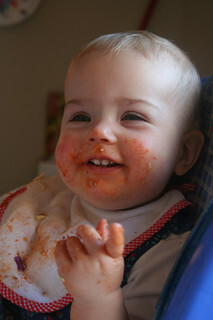 Bibs come in handy when peas dribble down their chins or when sauce-coated pasta is flung about in excitement. Luckily, we have some tips to keep those bibs in top condition to continue the defense against stains. These foods can be some of the most difficult to tackle as their natural pigments often embed themselves quickly in the fibers of bibs. A vinegar mixture of one part vinegar to two parts water applied to the stain usually helps. Allow the mixture to sit for about 10 minutes and then proceed with a normal wash cycle. Most protein-rich baby foods should not be a major worry. The best way to tackle these is by pre-treating the stain with a mixture of water and liquid soap. Allow the bib to soak in the mixture for 10-15 minutes and continue to wash in your machine on a normal cycle. Just as oil stains damage clothing quickly if left unresolved, the same is true with bibs and baby rags. First, apply baking soda or talcum powder the stain and allow it to sit for a while. The powder will absorb and dry the stain. Scrape the powder off after 10-15 minutes. Then, apply the same mixture of water and liquid soap as above. Let this mixture sit for 10-15 minutes and wash as regular. You have far more important things to worry about when raising your child than stains on their bibs. The cleaning process should not be headache with these simple tips. Good luck!